One piece of old fence wood, approx. 4" by 9"
20 gauge wire - approximately 12"
Cut the fence wood to size, using a table saw, jig saw or band saw - take care to follow all safety precautions. Brush the fence wood free of dirt and any loose particles of wood. You don't want to smooth the wood out with sandpaper, as the texture is part of what gives it charm. Looking at the photo for reference, paint most of the surface in lime green. This color is more yellow than green when mixing the 2 colors to make lime. The top area ("hair") is painted purple. Don't worry about getting several solid coats of paint - unless that is the look you want. This one has one coat of paint. You could slightly sand the edges and surface if you want a more weathered, rustic look. If you have "new" looking edges where the wood has been cut, use a piece of charcoal or the side of a pencil to darken it. Just rub it on the surface, then wipe any loose residue off with a cloth. Repeat the process until you have the shade you want. Again using the photo for reference, paint the face details. A permanent marker does not work well on this kind of wood, as it is rough and it's difficult to draw solid lines. Use black paint on a liner brush instead. The bats are made from 1/4" wood for the wings and a round, pre-made disk for the head. Use the photo here to make a pattern - from wing tip to wing tip it measures 3 1/2". Paint the round disk and the wings black. Using photo as a reference, paint the details white with a fine liner brush. When all painted surfaces are dry, spray Frank and the bats with a couple coats of acrylic sealer, allowing them to dry completely between coats. Be sure to do this in a well-ventilated area. Using an appropriate size drill bit, make a "starter" hole in both sides of the head. Make a pilot hole like this will help prevent the wood from splitting out when you screw the bolts in. Insert the bolts as seen in the finished photo. Take a 6" length of wire for each bat and curl it tightly around something with a small circumference, such as the end of an old paintbrush. Using a very small drill bit, drill a hole in the wings on each bat and a hold in Frank's head (wherever you wish to place the bats). Place a dab of permanent glue in each hole prior to inserting the wire. Stick one end of the wire in a bat and the other end in Frank's head. Once the glue is dry, the bats will have a little bounce to them, and the glue will help keep them securely attached. Untwist a 9" length of black paper twist ribbon, Tie it tightly in the center and fan out both ends. Glue this paper "bow tie" at Frank's "chin". To hang your Halloween cutie, drill a shallow hole in the top center of the backside to hang it on a nail. Or you may prefer to attach a length of wire from bolt to bolt, making sure you take it above the head for hanging. 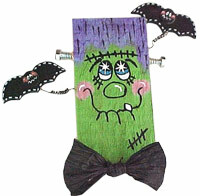 However you choose to display him, Frank is sure to bring rave reviews this All Hallows Eve!